Strawberry season is now upon us, and I couldn’t be happier. Our local farm/orchard has signs advertising that we can pick our own, but so far I’ve chosen to just pick up my own carton. Considering how quickly they are gone, I think I’ll be picking up more soon. 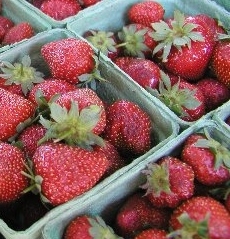 Fresh strawberries always make me smile. Posted on June 16, 2014, in My life, perspective and tagged 365 reasons to smile, food, life, musings, relationships, smiles, strawberries, summer, Thoughts. Bookmark the permalink. Leave a comment.